John HARVEY & Elizabeth GEORGE came originally from Redruth, Cornwall. Possible parents of John HARVEY are Humphry & Mary HARVEY who had a son christened 9 March 1800 in Redruth, Cornwall. Elizabeth GEORGE's parents are Richard GEORGE & Mary HARDIN and Elizabeth was christened 5 June 1803 in Redruth. John HARVEY was a miner and when the family migrated to South Australia in 1840, Cornish mining was going through difficult times. Free passage to the newly formed South Australian Colony, under the Assisted Migration Scheme of 1836-1840, must have seemed very attractive. The family set sail on the vessel 'Waterloo', London via Falmouth, arriving in Port Adelaide on the 9th of November 1840. It has been written that the passage from England to Australia during those early years of migration was long, arduous and full of danger. Ship wrecks were commonplace, as was disease, starvation and early death. Many a young hopeful either never made it to their brave new world and if they did, their mental and physical health could well have suffered ever after. It was said to be an experience that none of them could ever forget. 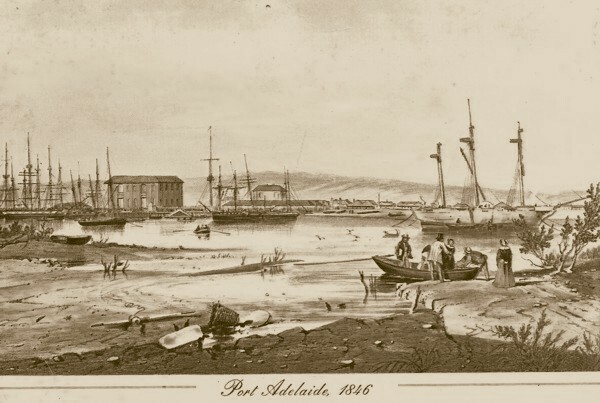 The colony of South Australia was barely four years old and had a population, recorded in the 1841census, of only 15,485 which was still mostly confined to what is now the city of Adelaide, then a raw outpost of the British Empire, little more than a shanty town of mostly make shift dwellings and mud tracks made hazardous by the giant potholes from felled gum trees. John and Elizabeth HARVEY and five of their children appear in the 1841 South Australian census, living in the still very primitive Adelaide, on Currie Street, now part of that city's CBD. At some stage after the census John and Elizabeth, along with their two younger children, Jane and William, disappear from South Australian records and it is possible that the lure of gold during the 1850's Victorian gold rush saw John and Elizabeth travelling the lonely, dangerous bush tracks, with all the other hopefuls, to the beckoning gold fields of Victoria and Ballarat. Certainly there are tantalising hints of their presence in those regions, still to be investigated. Read Richard Clode's account "The Frustrated Gold Seeker" & "A Gold Digger's Story"
Their eldest daughter, Elizabeth HARVEY, migrated as a domestic servant in 1840, and married widower, George Bailey, in 1843 at Holy Trinity Church , Adelaide, the oldest church in South Australia. The Bailey family then moved to the newley opened up Adelaide Hills area eventually settling in the township of Echunga, South Australia. After the death of George Bailey, Elizabeth married William Smith in Echunga in 1872. She died in 1889 and is buried in St. Mary's Church, Echunga. Mary Ann HARVEY, we believe, married David MOTT and settled in Macclesfield, also in the Adelaide Hills area along with a great many other members of the MOTT family. Brothers, John HARVEY Jnr. and Samuel HARVEY, settled in Gawler, South Australia. John HARVEY Jnr and his wife, Jane LONELY, were childless and both are buried with Samuel Harvey in Willaston Cemetery. A recent development regarding what became of John HARVEY snr after 1841 is that of a possible second marriage. A Betsy HARVEY and her daughter Jane died May 1841 in Adelaide. Then on January 9 1842 a John HARVEY married widow Jane ROBERTS nee LITTLE in Adelaide. The possible death of John HARVEY's first wife, Elizabeth GEORGE, sometime in 1841 could explain why that couple seems to disappear after the 1841 South Australian census despite Elizabeth being young enough to bear more children. But, it must be said, there were several John HARVEYs who arrived prior to 1842 besides our own and so this 2nd marriage theory must remain just an interesting hypothosis until further evidence comes to light, one way or the other. John HARVEY & Jane LITTLE had two sons, they were Humphry HARVEY (1843-1848) and Joseph HARVEY born 1846 Enfield, South Australia. Joseph HARVEY married Elizabeth KNOTT in 1871 and they had four children, three of whom were born in the Willaston/Gawler area. They were John HARVEY (1872-1898), Elizabeth Jane HARVEY born 1874, James Albert HARVEY born 1877 and Joseph Newton HARVEY born 1879. 1843 Holy Trinity, Adelaide, S.A.
1850 St. George's, Gawler S.A.
1858, St. George's, Gawler S.A.